Traditional Centrex and PBX are systems developed and installed before VoIP came into being. Both of these systems are based on a telephone switch which is a large rack-mount computer system. The telephone is connected to the switch, which establishes a connection when a call is made or received. More detailed description about structure of Telephone Systems read here. The three main differences between Centrex and PBX are location, location and location, depending on whether the telephone switch is in the Central Ofﬁce (Centrex), or at the customer premise (PBX). When the switch is located in the customer premise, it is called “having a PBX”, or a Private Branch Exchange. Customers can buy, rent or lease PBXs, and can provide their own in-building switching, in-building dialing plan and dial tone. If the dialing plan consists of assigning every telephone in the building a four-digit “extension” number, users simply enter the extension number to call another phone connected to the PBX in the same building. More about dialing plans, you can read in this article. A PBX can provide many features, including call pickup groups, no-answer transfer, Interactive Voice Response menus and call center functions like Automated Call Distributor (ACD). A PBX is connected to the telephone network with PBX trunks between the PBX and C0 switch. One trunk is usually provided for about every ten telephones. When a user is off-hook, they’ll hear a dial tone from the line card in the PBX. When 9 is dialed for an outside line, a PBX trunk is assigned, a circuit-switched connection is made to the CO switch, and the user hears a second, different dial tone generated by the CO switch. PBX trunks are available as one-way incoming, one-way outgoing, or both ways. This does not refer to the voice communications capability, which happens in both directions in all cases, but refers to whether these trunks are used to receive phone calls, initiate outgoing calls, or both. Both PBXs and Centrex support digital and analog telephones. Digital telephones, often called Electronic Business Sets, are far more popular as they support a much richer feature set and user interface. “Digital telephone” means that the voice is digitized in the telephone and communicated as is. It is sent along with call control messages from the phone to the switch, and is represented by voltage pulses on copper wires. For traditional Centrex and PBXs described in this article, the formatting and coding of the digitized voice and call control messages are not based on standards. This means that only telephones supplied with the Centrex service or PBX device will work. This is done deliberately to lock the switch customer into buying all phones and upgrades from the PBX or Centrex vendor. This is a source of income for the vendor. This is really sometimes a problem when you need extend these phones on larger distances than copper last mile standard allows you to do. For example, our PCM POTS voice fiber multiplexer series muxes, which will work in a way, that it will first convert electrical signal to optic light, will require standard POTS type analogue signal and will not accept these private protocol type digital extensions. New generation Voice over IP (VoIP) systems are much more likely to use standard methods of coding and call control messaging, although this is not guaranteed. If this is the case, third-party telephones can be used. The term Exchange is an older term for a circuit switch. Private means that the customer owns the switch, not the telephone company. Branch refers to the topology of PBX trunks that look like branches that come off the main telephone company’s tree trunks. 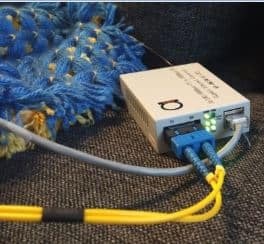 In the beginning, a PBX was implemented with a board with jacks terminating loops and PBX trunks, and operators connected loops to PBX trunks manually with a patch cord, like the ﬁrst CO switches. Like CO switches, PBXs were first implemented with mechanical systems, later followed by computers. Computer-based PBXs were called Private Automated Branch Exchanges (PABXs) for a while, but this term is not used often anymore.